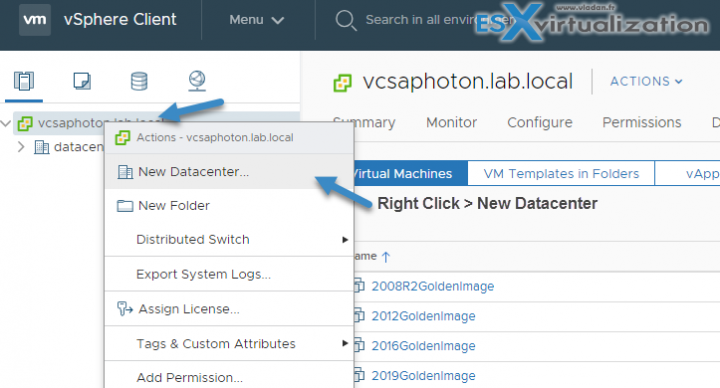 This post, VCP6.7-DCV Objective 4.2 – Create and configure vSphere objects, will detail the configuration of vSphere objects (clusters, datacenters….). As you can see there is a year in the title, so next year, we'll have VCP-DCV 2020 certification as the title. What does it mean? Basically that the exam is tightened to the year when you have passed. You can find all the objectives required for the exam at our VCP 6.7-DCV Study Guide WordPress page. 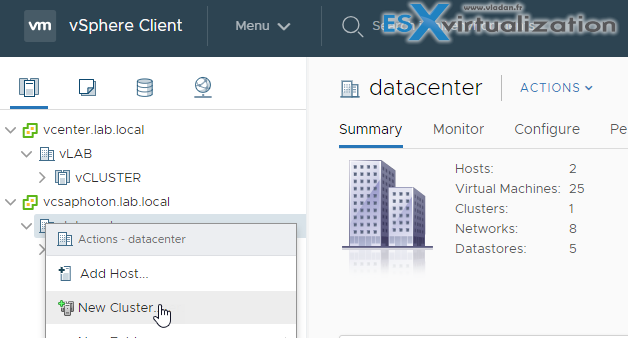 Let's get back to our objective, based on the If you have VMware ESXi cluster configuration, managed by a vCenter server, multiple ESXi hosts provide compute, memory, and network resources to the cluster environment as a whole, as well as protect cluster-housed VMs against physical server failures. Once cluster created, a vSphere cluster can have some “cluster only” features such as HA (high availability) or DRS (distributed resource scheduler). We'll see it in details further in this post. A large vSphere implementation might contain several virtual data centers with a complex arrangement of hosts, clusters, resource pools, and networks. It might involve multiple vCenter Server systems connected using Enhanced Linked Mode. Smaller implementations might require a single virtual data center with a much less complex topology. Set up networking by using vSphere Standard Switches or vSphere Distributed Switches. To use services such as vMotion, TCP/IP storage, VMware vSAN, and Fault Tolerance, setup VMkernel networking for these services. Configure storage systems and create datastore inventory objects to provide logical containers for storage devices in your inventory. 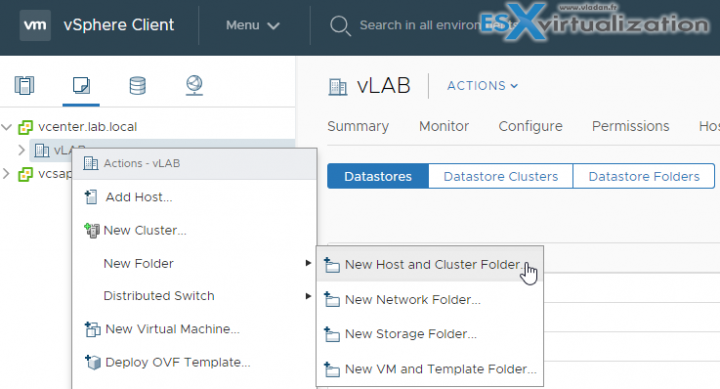 Create clusters to consolidate the resources of multiple hosts and virtual machines. You can enable vSphere HA and vSphere DRS for increased availability and more flexible resource management. Create resource pools to provide logical abstraction and flexible management of the resources in vSphere. Resource pools can be grouped into hierarchies and used to hierarchically partition available CPU and memory resources. A data center is a container for all the inventory objects required to complete a fully functional environment for operating virtual machines. You can create multiple data centers to organize sets of environments. In the vSphere Client, navigate to the vCenter Server object, Select Actions > New Datacenter > Rename the data center and click OK.
You can also use right-click action by clicking the vCenter server in your inventory. It is then possible to add hosts under a data center object, folder object, or cluster object. If a host contains virtual machines, those virtual machines are added to the inventory together with the host. There is not a single or preferred way to proceed. You can either start created cluster object and then add hosts there, or you can add hosts to your datacenter first and then only create cluster(s) objects. Host > Inventory > Add host to cluster. Resource > Assign virtual machine to resource pool. System > View on the virtual machines folder where you want to place the virtual machines of the host. So, in order to add a host to the inventory, do a right-click the data center, cluster, or folder and select Add Host > Type the IP address or the name of the host > Type administrator credentials > Review the host summary > License the host. Folders are for grouping objects of the same type for easier management. You can then apply a set of permissions to folders. A folder can have other folders inside, and also a group of objects of the same type. Similar way as Windows Explorer. As an example, a single folder can have VMs and another folder containing other VMs. However, you cannot have hosts inside a folder and then a folder with VMs. After you have created your datacenter, you can create clusters. Clusters are usually based on type of workload used, geographical location…. 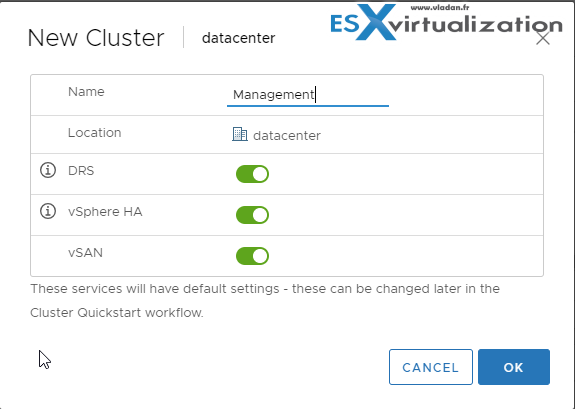 You can create an empty cluster, activate some services (vSAN, HA, DRS) and then add hosts into that cluster. The steps: Right click a Datacenter Object > New Cluster. Put some meaningful name, and activate the services you want the cluster to assure. In our case, we're activating all cluster services. The different individual cluster services, such as HA, vSAN or DRS shall be studied through vSphere Availability PDF. You'll find topics about vSphere HA, the concepts, how it works, what's master and slave nodes, host failure types, VM and application monitoring or Network partitions. But there are other chapters from the blueprint which will cover those technologies in details. For example, the Objective 1.6 – Describe and differentiate among vSphere, HA, DRS, and SDRS functionality. Or we have the Objective 2.2 – Describe HA solutions for vSphere or Objective 7.6 – Configure and use vSphere Compute and Storage cluster options. Below are some basic concept articles and guides from vSphere 6.5 which might be usefull as well. Don't forget to check our VCP6.7-DCV Study Guide Page for all chapters for the exam.